There is something that feels different about this particular friendly. Perhaps its because Palestine played China before the 2015 Asian Cup or maybe its because the tournament is a mere 47 days away. 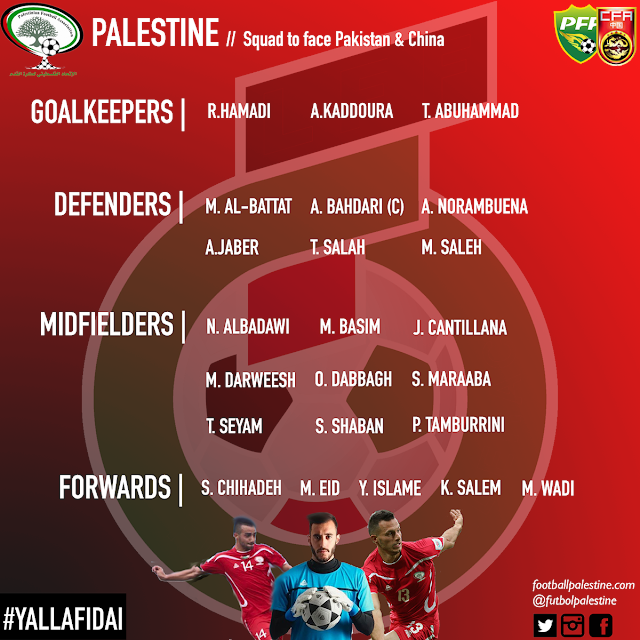 In any case, China will be a completely different proposition to Palestine's last four opponents. While challenging, this might just be what the doctor ordered. Since readmission to FIFA in 1998, Palestine has been an underdog in the vast majority of its 157 official matches and that will certainly be the case again come January. 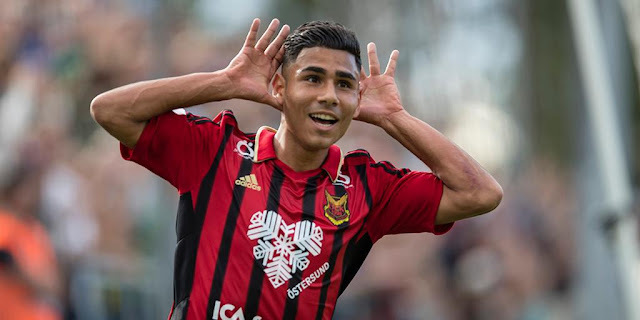 Nouredine Ould Ali's game plan will certainly reflect that fact and the team will be set up to neutralize the opponent's threats first and attack second. As an opponent, China is a far more ideal test to put methods into action than the likes of Pakistan. While the results have been there over the past two months, its quite clear that the national team does not have enough depth in key areas of the pitch. The Alexis as a CB experiment might prove viable but he was relatively untested for the majority of the match against Pakistan. In any case, the national team will live and die with their captain and his form. Abdelatif Bahdari should receive his 58th cap in this game- pulling him level with Saeb Jendeya as the most capped defender in national team history. The other players who should return to the starting lineup are Mohammed Darweesh and Pablo Tamburrini whose respective stocks received a boost after a less than stellar performance from Shadi Shaban and Mohammed Basim. 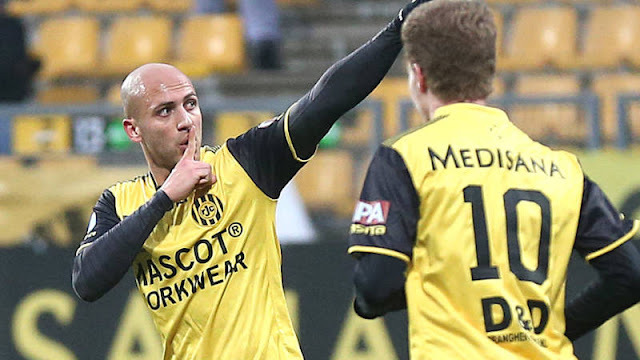 Darweesh is by far and away the most underrated player in the side. His presence is critical if Palestine are to have any success at the 2019 Asian Cup. Not only can he shield the defence and cut out attacks- his long range passing ability has always been an overlooked quality. Pablo Tamburrini is similarly unappreciated. His highlight reel will not include anything spectacular and that is just the point. Tamburrini plays intelligently- he does not gamble and keeps things simple- which gives confidence to the attack while taking pressure off the defence. In attack look for Ould Ali to retain the trio who combined for the winning goal. Mahmoud Eid had one of his best games in a national team shirt while Yashir Pinto Islame showed an ability to influence the game without scoring- a quality the younger, less experienced Mahmoud Wadi still lacks. If there is one thing that characterized Chinese football over the past decade, it is the unwavering desire for officials in the country to improve the level of football. Thing have not gone according to plan- and there will be a big problem for the CFA to solve upon the culmination of the tournament. Marcello Lippi- who led Italy to World Cup glory in 2006- will leave his post vacating a salary of upwards of $23 million USD per year. The Chinese national team did improve under his stewardship but he came too late to salvage their 2018 World Cup qualifying campaign. The hope will be that China can win a knockout game at the Asian Cup for the first time since 2004- when the then hosts made it all the way to the final. It seems Lippi is picking the right time to leave it seems with the bulk of his key players in their early 30s and late 20s. The Olympic team fell flat on its face as hosts of the AFC U23 Championships so there isn't a young generation coming through that can supplant current starters. For its part, the Chinese FA has been working on some pretty unique ideas- like getting its youth teams to play in the Croatian lower leagues. Preparation in 2018 has been less than stellar. The Chinese were walloped by a combined 10-1 scoreline by Czech Republic and Wales in March. That was followed up by a narrow 1-0 win vs. Myanmar in May and a 2-0 win over Thailand just before the World Cup. China has since lost to Qatar 1-0 and played two scoreless draws against Bahrain and India. 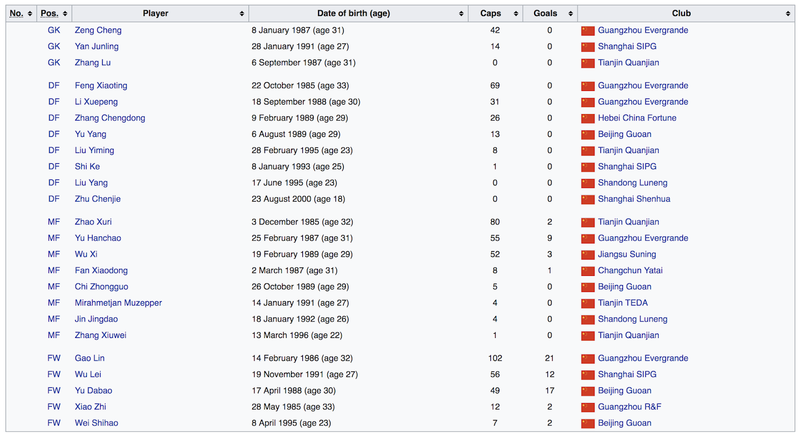 Their last game saw marked improvement with the Chinese beating Syria 2-0. Ongoing financial support from our readers means I can continue publishing stories, tracking statistics, and making Photoshop artwork. 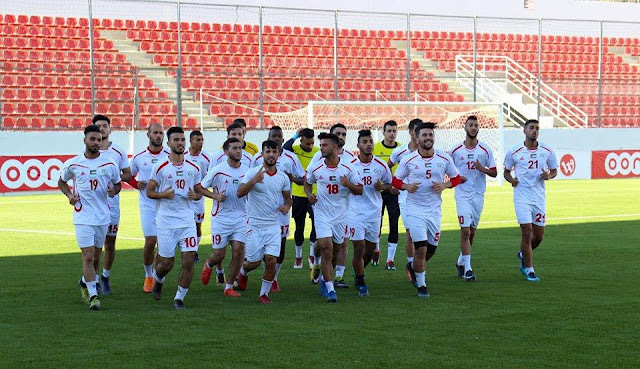 Football Palestine is editorially independent – the journalism is free from commercial bias and not influenced by the FA or any ulterior motives.